Ethics and Religious Liberty President Russell Moore and the Southern Baptist organization committed to our liberty has been strangely silent as numerous Christian leaders and religious liberty organizations announced the threat to Christians from a new legislative move in California. Assembly Bill 2943 would seriously curtail Christian voices regarding the power of Christ to deal with LGBTQ desires. Specifically, the bill would ban exchange of funds for counseling, books, conferences, etc. that would attempt to change orientation, behavior or identity. From the frontlines of the religious liberty fight came this disturbing revelation—the ERLC despite being aware of the California legislation since early April, has done nothing to raise awareness on the issue among rank-and-file Southern Baptists. The committee approved the bill on April 3 with approval by the full house on April 19. The Alliance Defending Freedom released its analysis of the bill on March 8. One leader in the fight against the California bill noted the ERLC’s lack of public response and pointed out the RL (Religious Liberty) part of the ERLC’s name is kind of a big deal and core to its existence. Russell Moore has time for Dreamers, but not to fight for the religious liberty of American citizens living in California.This isn’t shocking. His ERLC has tweeted out George Soros immigration propaganda. 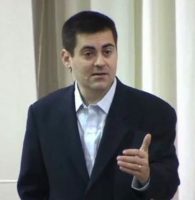 While religious liberty dies in California, Russell Moore’s ERLC was busy promoting the racial demagoguery it celebrated at its Memphis conference (racialism soundly rejected by Christians of all races including leading evangelicals like the Just Thinking podcast and radio program). It also promoted prison reform. Dr. Moore even promoted progressive immigration policies supported by George Soros with an appearance on the Immigration Forum podcast.